hit England’s fastest one-day international century to lead them to an 84-run win over Pakistan in Sharjah and a 3-1 series victory, reports BBC. 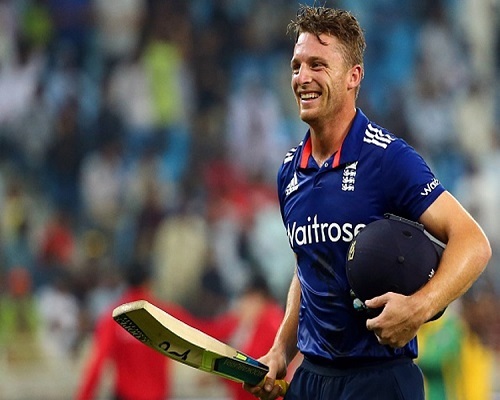 Buttler reached three figures in 46 balls, beating the 61-ball hundred he made against Sri Lanka in May 2014. The wicketkeeper hit 10 fours and eight sixes in his 116 not out from 52 balls as England posted 355-5. Pakistan briefly threatened a thrilling chase, but were bowled out for 271, with Moeen Ali taking 3-53. Buttler’s effort was the joint-seventh fastest in the history of ODI cricket and the quickest against Pakistan. He has now scored the three fastest England centuries in the 50-over game, along with a 66-ball hundred against New Zealand in June. That was Buttler’s last score of 50 or more in all international cricket, a run of poor form that saw him dropped from the Test side for the third match against Pakistan this month. The record for the fastest hundred in ODIs is the 31-ball effort of South Africa’s AB de Villiers made against West Indies in Johannesburg in January this year.